Teams pitch to the Hack//Meat Judges: (Left to Right: Nicolette Hahn Niman, Bill Niman, Michiel Bakker, Amol Deshpande, Chris Cosentino, Niko Hrdy and Anya Fernald.) Photo Credit: Mona T. Brooks. For 48 hours on June 21-23, over 250 food industry leaders, entrepreneurs, technologists and creatives convened at Hack//Meat Silicion Valley, a hackathon to develop hardware and software solutions to some of the greatest challenges facing sustainable meat production and consumption. The three-day event was held at theInstitute of Design at Stanford, and was organized by Food+Tech Connect in partnership with Applegate and GRACE Communications Foundation. 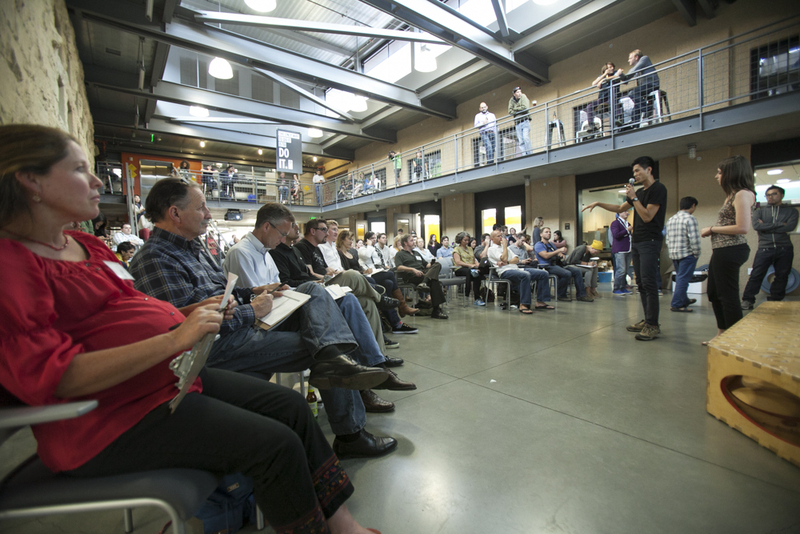 The hackathon’s 24 teams tackled sustainable meat industry challenges including access to farmland, food labeling, whole animal utilization, and the unique flavor profile of grassfed meat. They pitched their final prototypes to an expert panel of judges including Michiel Bakker of Google’s Global Food Services, Bill and Nicolette Niman of Niman Ranch & BN Ranch, Niko Hrdy of Valley Oak Investments, Amol Deshpande of Kleiner Perkins Caufield & Byers, Chris Cosentino of Incanto and Anya Fernald of Belcampo Meat Co. Winners were awarded prizes worth more than $125,000, including cash and consulting services from industry leaders to help them continue development of their projects. Grand Prize Winner: FarmStacker, an eHarmony or AirBnb-like tool that connects young farmers to land and capital. Best Business: Cow Share With Us, a purchasing platform that facilitates group buying of whole animals. Best Social Good: Buyotic, a mobile app that helps consumers shop their values by locating antibiotic-free chicken and make pledges to purchase it. Best Use of Technology: Agent Yum, a Google glass application that allows shoppers to scan food products in the grocery store to deliver GMO and antibiotic ratings. Best Design: Beefopedia, a web-based portal that educates consumers on and celebrates the qualities of heritage beef. Cow Pool, an online purchasing platform that streamlines the supply chain from rancher to processor to consumer. Cash Cow, a smart scale solution to help butcher’s track profitability. Esri Award: The team(s) that makes most creative and effective use of Esri’s ArcGIS maps, apps, data, or APIs will receive $500 cash and two registration passes to the 2014 Esri International Developer Summit, in Palm Springs, CA, along with their own speaking slot scheduled into that conference’s agenda. Stewardship Agent, a data base similiar to MLS that allows young new ranchers to gain access to underutilized private lands, through a real-estate-type agent. Find Pasture, a platform that allows farmers to identify suitable land to buy, lease, or share based upon deep data analytics around the type of animal they are looking to raise. 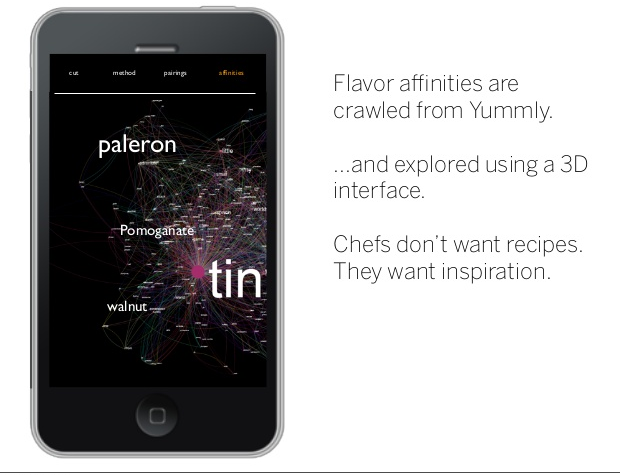 Yummly Award: Three teams that made the best use of Yummly’s recipe API win 1-year access to its top API Plans. More information. Teams were coached by 56 industry mentors including Stephen McDonnell, CEO of Applegate, Mitchell Davis, VP of the James Beard Foundation and Matthew Rothe, co-founder of the FEED Collaborative at Stanford.Butchers Ryan Farr and Kent Schoberle from 4505 Meats conducted a live butchery demo, breaking down a quarter of beef from a grass-fed cow raised in Oregon that had been slaughtered earlier that week and donated by Estancia. Lucky participants got to take the meat home with them. In keeping with the theme, attendees were fueled all weekend long by delicious, sustainable food and drink, including a nose-to-tail dinner provided by Google’s Food Team featuring a spit-roasted pork tasting and pig ear pizzettas. “There has never been more interest in sustainable meat production, but the challenges of scaling it to the population are huge. We’ve been so lucky to find partners like GRACE Communications Foundation and Applegate that share our vision for bringing people from different disciplines together to address these challenges and build a better future for food.”says Danielle Gould, founder of Food+Tech Connect and organizer of the event. For more information visit Hack//Meat, Twitter (hashtag #hackmeat), Facebook or Instagram. Media Inquiries contact rachel@prcollaborative.com, 413.884.4715. The Butcher’s Guild, Yummly, AgLocal, Google, Good Eggs, Stonyfield, Esri, Kitchit, General Assembly, Fine & Rare SF, Luke’s Local, Velocidi, Estancia, FEED Collaborative, The Design Gym, O’Reilly Media, Carhartt, The James Beard Foundation, Fare Resources, Llano Seco, Cosemble, Food Startups, Dwolla, Foursquare, and Pushpins.